An exhibition featuring new work by contemporary British photographer Colin Wilson opens at Argentea Gallery in Birmingham 21 March 2019. 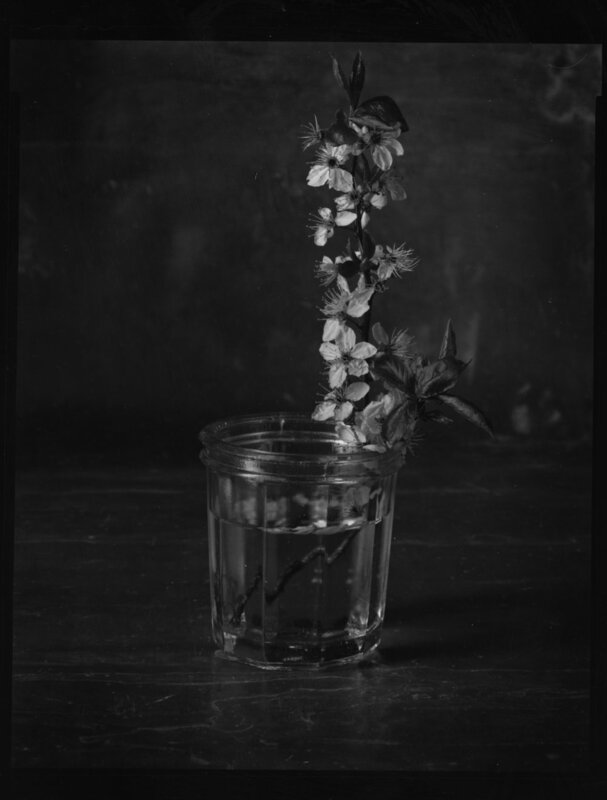 Memory of Touch is a body of work that focuses on still life through black and white film. The show has two broad series of works. One is a set of studies of constructions of objects which are propped up and displayed to us almost as primitive sculptures. Rocks are placed on top of plates which become plinths. Blossoms are shown in rudimentary glass jars filled with water. Taken in a studio setting the light can be controlled but to strip the images of even more possible background noise, the objects are placed in front of a lead ground. This means there is a uniform light on the back of the image and no light or shade to distract. What that achieves visually is the most wonderful dark void in the back of the images that enables the light on the objects to be the stars of the images. There is a modernist sensibility to this work which becomes a meditation about form and shape and volume. Light and dark are continuing themes in this work and are taken further in the series which is titled Morpheus, a stunning set of images of glass bottles. Each of the bottles is different in shape and design and they all have ridges on their sides - making them formally more interesting and the surface more varied. But it has another meaning, as before literacy was wide spread, a ridged bottle was a code that told you it contained poison. These bottles would have all contained morphine, used both as pain relief but also as an opiate. Anyone who picked up the bottle would not mistake what it contained and would be made aware by touching it of the danger inside. They have been filled with a milk-like liquid to the rim, the meniscus of which we see on the top of the bottles. This refers again to the original contents. All pieces on display will be available to purchase.